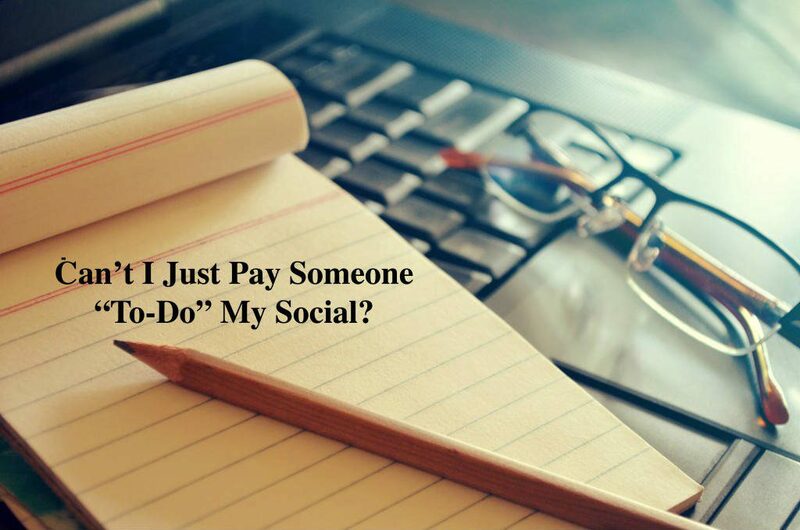 Can I pay someone to do my social media? In Episode 6 of Constructing Your Brand, Richie and I answer the question – “Can’t I Pay Someone “To-Do” My Social Media? We are asked this question on a regular basis – we tell you what you can and can’t outsource. We give you a simple suggestion to get you started. Hi, this is Richie DeMarco and Denise Butchko with constructing your brand.com and today we’re going to discuss why you can’t just pay somebody to do your social media. because it is great, but lots of people don’t want to put the energy into figuring all this out and I think we, both of us, have some pretty strong perspectives on what you can pay someone to do and what you need to invest in learning yourself. Oh absolutely. I mean, as much as I just like to throw money at things and make them go away, social media isn’t one of those things. 100 percent, Denise, and you know even in this example, if it’s just a small industry niche, you still need to focus. We all have designers and salespeople on the road. We wouldn’t send somebody off the street to just go start calling on customers right there. You don’t want that person to be the voice of your company. She has no product knowledge. So how can you have somebody be the voice of your company on social media that knows nothing about what you, what you’re doing or what your company does. I think that that’s a dumb move. I think that you should not do that. Think about the concept that your product has a voice now – twenty-four seven, three sixty five. So when you used to be able to run a print ad and it was a beautiful kitchen or a nice white melamine closet with the valet rail, it’s not the same anymore. Now the valet rail is talking. The wood is talking and the doors are talking and they’re talking all the time, all over the place. I’m not saying you need to be the one doing the tweeting or doing all the postingg or actually making sure the sizes of the image are correct. You can hire that out, but if you don’t understand what you’re trying to achieve, if you don’t have the familiarity with the program, with the platform, then you guide that ship and if you’re the owner of the business, you’re the CEO, you’re the VP of marketing, or if you’re all of those things, then how are you going to drive that train when you don’t even know where you’re going or what the train tracks look like? Just because your nephew or your grandson or somebody under the age of 30 knows how to use the platform and how to post a picture does not mean that they know how to create leads, create interaction and get people interested ain you and your company. In my second position where I worked when I was designing closets, the owner of that company said to me in a nice way, Denise just throw spaghetti at the wall and something will stick. And a long time ago that worked. Now you have to pick the brand of pasta, the kind of pasta, the pot, the filtered water. How much time you were going to boil it, what texture you want it to be like in the recipe, all kinds of variables. You can’t broadcast like that anymore. It has to be very identified and very specific. And if you don’t even know that you’re cooking pasta, I think you could send someone to the store, but you need to give them some instructions. That’s right. 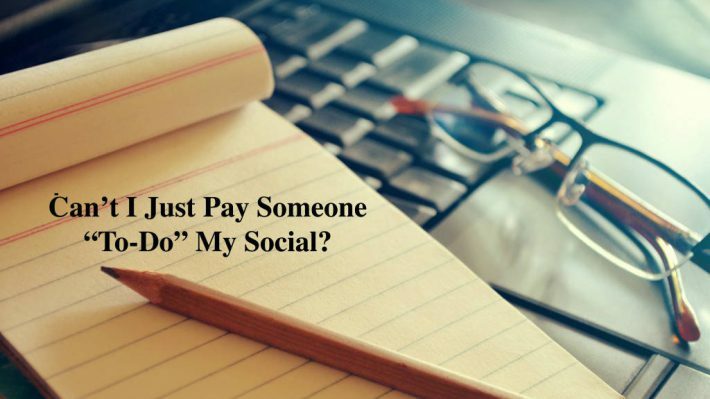 There are so many of these local companies out there that are doing social media very inexpensively and they’re just sharing that they have a lot of, a lot of stuff, that really has no importance to any of your clients or potential clients. So my simple suggestion would be to start looking at the different platforms and spending time on them. And you don’t have to think, OK, I’m going to go on. I’m going to create a blog. I’m going to be on twitter. I’m going to do everything. You learn how to start creating an account, start watching, start seeing what people do, see what you like, see what you think is smart, see what you think is noise. And then you’ll be able to guide somebody from there. But if you don’t even have a profile, then forget it. You’re throwing your money out the window and if that really is all you’re going to do, I could take your money and not promise you any deliverables and I just can’t. I can’t do it. I can’t in the long haul, I’m not going to sell you the easy solution. Also not going to sell you the cheap solution. You know I’m here or as you are, and that’s why we’re doing this, to partner with people who want to roll up their sleeves and get it and who want to learn and then figure out what is the best strategy. Ideas like here’s where I can outsource some of it or do we need to bring somebody in part-time. Or is this a part of somebody’s job (though please don’t just toss this on your admin person). All those pieces that need to fit together in the same way that your successful, profitable, well oiled machine of a business fits together. Because this is something that your business has to do and you just have to spend that time to figure out what the best strategy is. When it comes to strategic level, just throwing spaghetti against the wall isn’t going to work or the pasta will be so crappy you don’t want to eat it anyway. Which we see a lot on social media. There’s no simple answer. There is no easy answer. And if you found a cheap guy, then I got a bridge to sell you and I’m from Brooklyn.